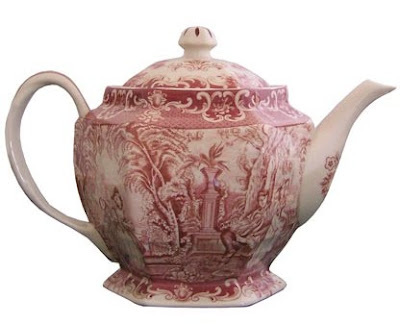 Beautytiptoday.com: Super Cute Porcelain Red Toile Print Teapot For Christmas! Super Cute Porcelain Red Toile Print Teapot For Christmas! Let us be frank here. We don't like tea, BUT---we DO adore super cute teapots. And we have girlfriends who like to collect them, too. Teapot Lovers Red from the DanielBooneTradingPost ($34.50, porcelain red toile-print teapot). It's so very 'Downtown Abbey! And we like the size of this Madison Bay reproduction teapot, measuring 9 1/2". It breathes British aristocrat. This makes for a lovely holiday gift, and looks much more expensive than it really is. A party hostess would enjoy receiving a present like this. If you're scrambling around, frantic for the perfect holiday gift, try a tempting teapot like this one.